While Ayrenn was occupied by matters elsewhere, her cousin Alwinarwe took the title of 'Proxy Queen' and sat on the Throne of Alinor, governing Summerset in Ayrenn's stead. When Ayrenn decreed Summerset's borders open to trade and travel, she faced opposition from Summerset's nobility, although this sentiment wasn't shared by all. 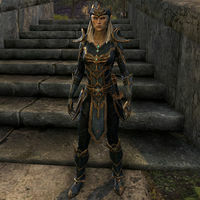 For game-specific information, see the ESO and Legends articles. This page was last modified on 11 January 2019, at 15:07.